Today my 11 year old keyboard died. (Full body view here) I'm devastated. If you look closely, you'll see the coffee stains. 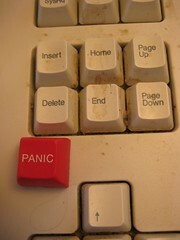 And, my panic button. The letters had worn off. Most importantly - I can't type as fast (I do like 100 words a minute on it). I got the keyboard after experiencing some carpal tunnel issues when I learned how to hand code HTML and was coding for hours a day. I sure hope there is a replacement out there ... It was called the "natural keyboard" from Microsoft. I also had a catastrophic computer crash which required wiping the hard drive and reinstalling windows (rebuilding the RAID array too). While a pain, everything was backed up. This happens every time I'm about to do an important preso and I take it as a good omen. And I really wish we had freegeek here in Boston to recycle it. 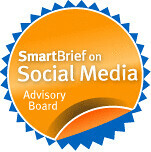 Great Governance: How can board members use social media to supplement face-to-face meetings? David Wilcox is helping Board Members of Housing Associations in Wales to figure how to use social media strategies and tools to supplement their face-to-face meetings. He started this group blog called "Great Governance" to host a conversation and collect ideas from other people. Face to face meetings for board members of an association of nonprofits is a precious resource, not to be wasted. I think you need to have a discussion about how would the use of social media tools make that time more effective? Face-to-face meetings have something over online communication: Inspiration. So, what value does inspiration provide? What parts of face-to-face meetings are not inspiring and could not take up valuable time if there was some communication online pre-meeting? Think beyond the cost savings of gas and travel costs. BTW, I reposting this video of David even though I can't hear it - computer crash, hard drive reformat, reinstalled windows, speakers aren't yet back up .. but I trust David and thought it might add to the context. Now, need another latte 'cause have had no sleep. I'm so happy that the computer crashed AFTER I had a chance to Skype into the session yesterday with David, Nick, and Laura. It was almost like being in the room minus the jet-lag. The downside is that I didn't get a chance to go to the pub and pick up any video interviewing techniques from Nick. Or ask who to do some geekily recursive videoblogging with David and Nick (happens usually after the first beer). This morning I got really early so I could participate in a panel for a conference with UK NpTechers organized by Laura Whitehead. (See the conference page at Lasa’s website for further details). This social media for the nonprofit sector panel also included David Wilcox of Desigining for a Civil Society and Nick Booth from Podnosh. (1) In the 5 campaigns I've done, it has evolved to a personal, socially networked fundraising campaign. Set up as experiments and learned and refined what works. (3) If you really want them to love you, tell them a story. I described the three story telling strategies I used throughout the campaign. (4) The hacked ladder of engagement - I'm noodling with this - it is a mash up of community organizer's ladder of engagement with personal fundraising campaigns and online social networks. What's important is that people go through different stages of involvement and participation in your campaign and your strategy has to move them along. You have to make it easy to participate. The challenge is scaling your personal fundraising passion and getting other people to go out evangelize or instigate on your behalf. I've been analyzing the campaign for examples and insights which I'll probably talk about next week at GSP as part of "Giving Good Poke." (5) The 3 R's Move Involvement: Relationship building, Rewards, and Reciprocity. I gave some examples. (6) Fun! Humor! Passion! Urgency! Competition! work together to build momentum and can lead to tipping the tuna in the last legs of campaign. (7) Saying thank you in creative ways to build a bridge to your charity/cause. I got some terrific questions that got me thinking. A.) Were donors from just the US? Were they one-time? Were they new donors? B.) Was the effort worth your time? I did this all volunteer, while still doing my day job. I lost a lot of sleep, but it was worth. How? Let's talk about dollars. 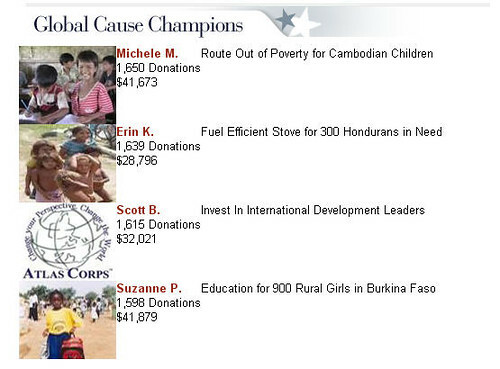 Since my first campaign in November 2006, I've raised over $200,000 - half of that prize money from Yahoo/NetworkforGood and Parade/Case Foundation. We've more than doubled our email addresses/names in our database - so for prospecting it was valuable. Some softer benefits or intangibles - we have a great collection of stories about the impact of the work that we can recycle and use, the visibility for the organization has increased, we're cultivating some of the new donors for major gifts (not from the recent campaign, but previous ones - we're in the middle of $3 m endowment campaign), and the attitude of people within the organization has become more favorable towards social media and online fundraising. C.) Was there anything that you feared by opening it up for your supporters to fundraise on your behalf? Were you concerned that they would go message, not include your branding, etc? The Sharing Foundation is an all-volunteer organization - so we're not a big institution with paid staff and logos and branding and messaging. Also, I'm probably working more as an "extra organizational" activist - so I am unencumbered by these types of fears that might be imposed from within. 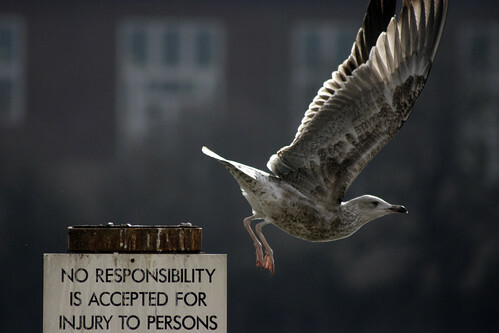 With that said, I did have a huge fear. That I would miss out on winning $50K for the Sharing Foundation. That drove me. My advice to you is loose your fear gradually and incrementally over time. I did this with each of my campaigns - trying a small step towards "opening my kimono" until I was comfortable being naked. For example, my biggest fear in November 2006 was whether or not I should blog about or ask professional work colleagues to give money to my personal charity. So, each experiment was a small lesson in fearlessness. Can't wait to do this again in a few hours with the repeat of the panel. Right now they're playing the social media game! Bora poked me and sent me this screencapture for the presentation . now to use this in a fun way. Thanks Amy! Been trying to figure out a good title visual for the presentation and realized that I could poke myself and screen capture. I'm coming to Minnesota at the end of the month to give a keynote at Message+Medium+Mission Conference, nonprofit tech conference co-sponsored by the good folks at the Minnesota Council of Nonprofits and MAP for Nonprofits. If you are planning on attending, I look forward to meeting you. If you're thinking about coming, hurry up because the early bird discount is only available until Feb. 29th. You can register here. Message + Medium + Mission is designed to provide an overview of current and emerging technology resources and tools and specific hands-on information to help you create effective communications to reach and engage your audience. The conference is designed for nonprofit leaders and practitioners at any level of experience. There's a session called Digital Youth and Analog Adults that looks interesting, lead by Graham Hartley that I hope to live blog or tweet. There's also a session called "Conversation Marketing: New Media Communication Strategy" by consultants at Tunheim Partners. The description sounds like a great compliment to the session I'm facilitating in the next time slot using the Social Media Game. My session will consist of small group work where participants can take some of their learnings about Social Media from throughout the day, have a conversation with their peers, and begin to think about putting it into practice. Beth Dunn is a Tech Star! 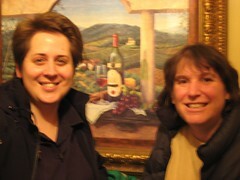 Last month I got a chance to hang out with nonprofit tech blogger Beth Dunn in Woods Hole. She's been honored as a tech start at @bar. Congrats! Chris Brogan tweeted about this blog this morning and I when I read the post it got me thinking. This graphic is a mashup of Priscilla Brisbane's illustration of Levels of Engagement in advocacy campaigns with this blog post from the Social Organization's blog about how how business relationships and how technology helps or hinders. I've been thinking a lot of about in terms of online social networking strategies and person-to-person fundraising techniques. The first stage is the encounter. This encounter can be physical or virtual and the channel (in person, over the phone, email, webinar, etc.) will partially determine how quickly the relationship moves to the next phase. The second stage is recognition. This happens when both individuals can put a name/face with a context. The fastest way to get to the recognition stage is to have an interaction that is highly relevant and has something to offer - an idea, a perspective, an experience. The third stage is relationship development. Once two parties recognize each other they can move into building a relationship. To build a meaningful relationship there much be a joint initiative that advances the relationship. The fourth stage is friendship. Friendship - whether in the social or business realm - represents a degree of trust above that of colleagues. A true friendship will allow two people, ironically, to operate more autonomously because they trust each other and the decisions they will make so constant re-calibration and discussion is not needed - and that saves a lot of time. The fifth stage is intimacy. This stage is not appropriate for most relationships - close and enduring, not necessarily romantic. In the business world intimate relationships do have a place - some bosses, mentors, and colleagues will progress to this stage and it enables even more synergy and speed but this stage is difficult to achieve and can rarely be achieved through the intent of one person. There is the question of what communications tools are appropriate for what stage of relationship building? I wonder if you can map specific tools to specific stages? I also wonder how and where face-to-face interaction is needed to build trust or move the relationship further. One of the things I've noticed recently is that my social networking profiles have been really helpful in helping me get to the encounter and recognition stage with my blog RSS subscribers. Many people will request to be friends on Facebook or Twitter or LinkedIN or Plaxo and I always ask people I don't immediately recognize how we know each other. Lately, people have been saying they are blog readers. So, this allows me to put a name, face and context. In the relationship building piece - Facebook can sometimes be a pain or maybe it is my more rapidly ocuring senior moments ... I remember someone, part of their name, and their context. I want to point to them or connect them with someone -- and I can't remember enough to easily find them on my growing Facebook list of friends. In the early 1980's ("olden days"), I was the general manager of small chamber orchestra located in Cambridge. The rolo-dex was one of my favorite tools for relationship building. I used it all the time to thumb through and find the right people to connect or bring together for whatever project or reason. I had a huge rolodex and it was color coded. I stapled people's business cards to the rolodex cards. I'd flip through if a person didn't immediately come to mind or if I couldn't immediately remember someone's full name or contact information. I just wish my Facebook friends or my gmail address book worked well for that purpose. As your personal network grows, what tools do you use to support relationship building? What techniques? Do you have an idea for how a mashup could be a tool for social change? 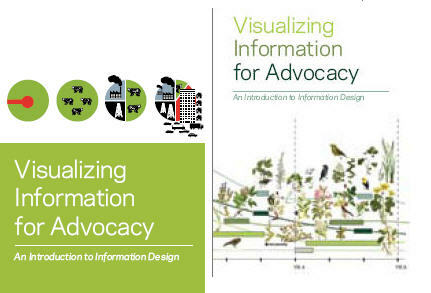 Can you imagine a way to combine data that would increase awareness around an issue? NetSquared, a project of TechSoup, is awarding a share of $100,000 in prize money, and a trip to the NetSquared Conference, to the top 20 winners of the NetSquared Mashup Challenge. You don't need to have tech expertise to submit a project to the Challenge, just an idea for a change you want to make that could be facilitated by a mashup. Wikipedia defines a mashup as, "a web application that combines data from more than one source into a single integrated tool." So, for example, MAPLight.org brings together campaign contribution data and legislators' voting records to raise awareness about the connection between money and politics. As you know, I do the weekly roundup of NpTech for NetSquared and they've just asked me to work on another project related to this MashUp contest - to pull together a resource list. Several weeks ago I wrote a post on BlogHer about Foko Madagascar and Joan Razafimharo, an amazing blogger, social change activist, and woman working in Madagascar and other parts of the world. She was the recent winner of my son's Green Geek Charity Contest and we contributed a small amount to the charity of her choice, SOS Children's Villages. I just celebrated my 26th birthday today! (but I enjoy saying " I am only 20 ") I this is the best gift ever! So I had great time eating my favourite chocolate waffle when watching Harry my favourite green geek. I've been corresponding with the people at SOS Village Madagascar (for the next blogathon) and I know they'll appreciate the visibility and donation you did with this video. On a sadder note my country was just swept by a cyclone last week-end and this time it is my turn to use your tips on fundraising and social media to help the people back home. I haven't slept much working on this project (but feeling really motivated!) and I can't thank you enough for the informations your blog provides us. Cyclone? Okay, maybe I've been really busy and wasn't paying attention to the media, but I didn't recall reading about it. A few clicks around Joan's personal site and I found this post from the Daily Green. Once again, it's cyclone season in the southern hemisphere. Once again, Madagascar is reeling. Once again, you probably didn't hear a thing about it in the U.S. media. Last week Cyclone Ivan – a storm mentioned worriedly in my last post – collided with the island nation as a borderline Category 3/Category 4 storm. (The Daily Green reported on its initial impact, when 11 were reported dead.) Ivan's track is pictured below, with darker purple representing Category 3 strength and lighter representing Category 4. The Foko site has a round up of YouTube Video coverage, including this one which gives a glimpse of the destruction. Reports suggest 15,000 are homeless because of the storm, and 22 dead. 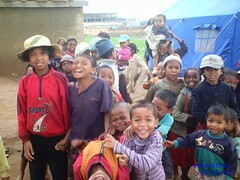 If you read Joan's blog or Foko, you will learn that Madagascar is a very poor country. Natural disasters like cyclones are not only deadly, but can cause economic damage to the vanilla crops, an important source of income because it is a key export. As this disaster has been largely ignored by the American media, it points to the value and importance of alternative sources like blogs and sites like Global Voices which provided this round up on the damage caused by Cyclone Ivan and the relief efforts. Joan has been an important contributor to these roundups, providing amazing coverage at her blog, The Purple Heart. There is a slideshow from this blogger, google map showing the path of destruction, and photos in Flickr from avylavitra. Joan says that if you want to donate to the relief efforts, Care in Madagascar is working in country and you can donate online here. (I just did). Jonathon Colman is the Associate Director of Digital Marketing for The Nature Conservancy, where he works on a team that is charged with the strategic marketing and promotion of The Conservancy's primary web site, nature.org. His team includes writers, designers, and web producers. I’m a product of the Great Lakes and have a degree in technical writing from Michigan Technological University. I’m also a returned Peace Corps Volunteer (Burkina Faso, West Africa), and am even now preparing to move from Washington, DC to Seattle immediately following a two-month fellowship in Australia. I've packed everything except for my laptop, the wireless router, all seven Avett Brothers CDs, and the beloved coffeemaker. You've experimented with quite a few Web 2.0/Social Media tools during your time with The Nature Conservancy. I'd like to know how you convinced your executive directors/senior staff to go for it? What were the concerns? What type of case did you make? I was (and still am) so convinced that social media and web 2.0 sites were the right way to grow our constituency and awareness online that I dedicated a lot of personal time to pursuing them both before- and after-hours. My wife and the aforementioned coffeemaker can both attest to that. So the case I made in the beginning was one of personal commitment. But I’m also blessed with entrepreneurial leadership who aren’t so risk-averse that they can’t see the value of investing in the future. And they challenged me and my colleagues to prove the value of our web strategy through constant testing and the presentation of hard-core data. Or, in another way of speaking: data talks and bull sh!t walks. The Conservancy, as a science-based organization, places a lot of value in numbers and data-driven arguments. Luckily enough, one of the most interesting parts of engaging in social media is how you can measure just about everything that you do. The real challenge, of course, is to determine the meaning behind those numbers. It’s taken us a long time to build up credible, authoritative profiles and groups on sites like Care2, Digg, Facebook, Flickr, and StumbleUpon – a lot of our initial efforts weren’t exactly home runs – but now that we’ve laid the foundation, we can get a huge response from these networks for our campaigns. So each time we complete a major effort on these social media venues, we measure our results and report back on our progress. The case I’m making now is not one about how good we can do if we get involved with social media, but how much better we can do if we get even more involved. Tell me about some of the strategies you've used to integrate social media into your communications campaigns -- and tell me how you measure success? What metrics? We have two main guiding strategies that help us direct our efforts. The first is to get people off the mouse and onto the keyboard. This means that we see a lot of value in commenting, linking, tagging, and the like; sometimes more so than just an empty visit to our site. I feel that someone who’s engaged enough to write a sentence or two or to participate in a conversation or to upload a photo with a caption is a person who’s inspired and compelled enough by our mission and success to take the next step. Here’s an example of a comment that I feel really illustrates this point. In response to a post on Digg about the Conservancy’s efforts to help preserve Canada’s Great Bear Rainforest, a user wrote: “This is one of the most breathtaking places I have ever seen. The photos are amazing, and the craziest thing is that 20 minutes ago I never knew it existed. Amazing job by the conservancy.” Even though this comment was made on digg.com and not on our nature.org web site, I’d still say that we succeeded in getting this person engaged in our conservation efforts. …which is a good segue into another principle strategy of ours: connecting with people where they are rather than making find us. Like many organizations, we used to be under the false impression that “if you build it, they will come.” But nowadays, we’ve come to think different about how we conduct outreach. Rather than force people to come to our site and remember another username and password, we’re happy to find them where they’re already engaged and introduce them to the Conservancy in venues of their choice. Our Flickr photo contest is a good example of this philosophy in action; we could have held the contest behind closed doors and made people sign up in order to submit and view photos... but wouldn’t that have just upset people and driven them away? Rather than build our own photo-sharing application, why don’t we just use Flickr’s awesome toolset and leverage the strength of their community? That way, we let Flickr and Yahoo worry about developing the technology while we’re left to focus on what we do best: get people involved with nature and their share their passion for our planet with each other. In terms of metrics, I like to look at measures of activity that involve more engagement than simply viewing a page or joining a group; the ones that get me all hot and bothered are when people participate in a discussion or upload a video or comment on a story. I think that you’re doing something right whenever you can inspire people to create new meaning that didn’t previously exist. Okay, let's fondle the hammer ... I'm going reel off the names of some tools that I've observed you using and would love your best piece of advice or tell me a story about how you've used it in your org. I routinely bookmark and comment on environmental news, green blogs, and stories about sustainability and alternative energy technology. One of our foremost social media strategies is to try to link to and promote as many stories as possible outside of our own site. This helps us be good community members and avoid issues of spamming. But for the Conservancy’s big-ticket stories, online applications (like our carbon calculator), or priority social media presences, I’ll send the link for our landing page to all of my contacts and ask them to give it a positive review. StumbleUpon referred nearly 17,000 people to nature.org this past January, and what most marketers don’t know about StumbleUpon is that the traffic performs in a manner that’s nearly identical to organic search traffic – these visitors stay on your site, travel to pages beyond just your landing page, engage with your media, and click your calls-to-action. For free. We just had (and are still reeling from) our best results ever from Digg: 76,000 visitors in a single day, including more than 18,000 visitors in a single hour (300+ people/second, if you can but dig it). All this traffic came to our brand-spanking new Everyday Environmentalist feature, which helps people learn simple ways that they can be more green. Now, in keeping with Digg visitors, these folks just viewed the landing page and most of them immediately left without viewing any other pages. But that’s OK, because our popularity on Digg drove in 50+ links from blogs, including a few elite sources like The Huffington Post and Cisco.com, and also caused “spillover” popularity into other social news networks. The real value from this particular success on Digg wasn’t so much the initial spike in traffic, but the increased SEO positioning and second wave of visitors coming from blogs and other sites. The Nature Conservancy’s Cause is now growing stably at around 1,000 people per week. We’ve also earned over $3,000 in the past month. The secret to our success is to reach out to the brilliant folks developing applications like (Lil) Green Patch and I Am Green, who are already donating a portion of their ad revenue to the Conservancy. We’ve asked these application developers to make that donation of earnings directly to our Cause on Facebook – this has the benefit of allowing them to report back to their users in a way that makes them highly accountable. Why? Because those visitors can go straight to the Conservancy’s Cause and see the donation for themselves without ever leaving Facebook. And while they’re there, a lot of these visitors are deciding to join up and donate. So the developers are happy because they have proven legitimacy and we’re happy because we’ve gained all of these application users as an engaged audience. Honestly: I’m far too unfocused to blog, so I turn to Twitter to publicize my social media campaigns, usually the ones on Digg. I have anecdotal evidence that a handful of friends following these tweets (all of them nptech pros) actually click through and vote on the stories. Twitter, Pownce, even IM can be used to draw people into your campaigns, but most folks never think to leverage these common, everyday tools for that purpose. But quite frankly, I think that there’s nothing more fun than using social media to promote social media. Beyond posting my snapshots of dogs, monuments, and my wedding in New Zealand, I don’t use Flickr very much. That said, my colleagues Sue Citro and Evan Parker have had great success running the Conservancy’s annual digital photo contest on Flickr: the 6,400 members and 64,000 images posted to date only tell part of the story; the real success has been in those photographer’s engagement with the Conservancy. So, what are you going to do in Australia? I’ll be leading a series of workshops for the Conservancy and our nonprofit conservation partners throughout the continent on how we can achieve more online. We’ll be covering all sorts of exciting things like how to build a web strategy that works, measuring ROI from our efforts online, conducting testing, getting started with search engine marketing and SEO, and even a little bit about blogging and social media marketing. Our ultimate goal is to increase web marketing capacity and infrastructure for conservation NGOs in Australia so that they can continue to learn from each other, achieve more online, and make measurable progress toward building a conservation ethic. Deborah Elizabeth Finn, the Cyber-Yenta, recently gave me a few ideas about how to help these folks develop a Community of Practice that can survive and continue to develop after I leave the country. Okay, can you share with me some of your latest slideshows? You bet – I love public speaking because it allows me to inflict upon an unsuspecting public my unique brand of humor, mostly gleaned from Mystery Science Theater 3000 and my 8-year semi-pro foray into improv comedy during college and up until 2003. I dance around a lot and use broad sweeping gestures alongside quotes from “Lost” and “Battlestar Galactica”. You can always find my latest presentations on SlideShare – the next one will be launched on February 26, the day I speak at the National Press Club. It will be an exciting case study involving Digg with some keen recommendations on when and how nonprofits can best take advantage of social news sites. For folks in Washington, DC, you can still register for the event, “Social Sites for Social Good,” hosted by Forum One Communications. Who is that doggy in your twitter avatar? Hey, here’s a little secret: that’s not even my dog! It’s my mother’s pup who goes by the name of Yooper – I grew up in Michigan and folks from the Upper Peninsula are called “Da Yoopers”. And if you ever get a chance to hear the band by the same name, I highly recommend staying around for their song, “The Second Week of Deer Camp”. If it doesn’t put a smile on your face, then nothing will. Like any good marketer, I tested a large series of photos as profile pictures to see which ones would perform the best. That’s one of the beautiful things about participating in all of these social networks and Web 2.0 sites: with enough time, patience, and Excel files, you can measure and test just about everything! 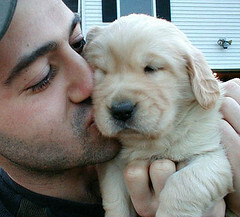 The photo of me kissing the puppy always attracted the most links and friend requests – including this rather, ummm, interesting paean – so I decided to standardize it on all my profiles across every platform. Is there anything that the Web can’t tell us? Harry's last green tip introduced the Charity Contest that allowed readers to submit a comment that included a suggestion about how to save energy or be green and the name of a charity. The winner would be the topic of Harry's video and we'd donate $20 the winner's choice of charity. We're pleased to announce that Joan Razafimaharo was the winner, offering the above tip about light bulbs. We used a Network for Good good card to donate to Joan's charity, SOS Children's Villages. Here's the screencast. The tip was to turn off the lights when you leave a room and to switch to CFL light bulbs. To learn more about how CFL can save energy here and find out how your state ranks in saving energy this way at the 18 seconds campaign site. We're going to continue to include the $20 Charity Giveaway Contest (I still have a few gift cards that I got as gifts to recycle ..) As a parent, this is a great way to show Harry how to take the next step and integrate philanthropy into his activism. It is also a good way to stay involved with your child's online usage and guide as suggested in this article by Arun Rajagopal. Special thanks for the inspiration goes to Little Laura's Twenty Five Days to Make a Difference. Include a sentence or two about an cause or organization where we can make donation online via Network for Good. Harry (with my help) will read and vet the requests and pick one. The winner will receive a $20 donation from us. You have until March 15th! The other day I was a guest on a NTEN Webinar with colleague John Kenyon (who says he going to star a blog) and one of the participants inquired about the use of social media and causes like Missing Children. I promised to send an example, but didn't get his email - so I hope he is reader here. Nate Ritter put this together. 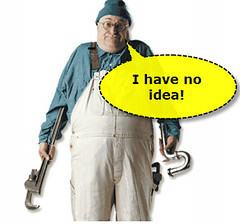 He describes why and how in the blog post. David J. Neff from the American Cancer Society just gave me a heads up that he is speaking on a SXSW Panel called Adapt or Die: The Future of Volunteers and Nonprofits. Who else is attending or speaking at SXSW? Northern Voices is one conference that is on my bucket list. Like my colleague Nick Noakes, I've followed it from afar reading posts from Nancy White and Alan Levine via the their blogs and social media. 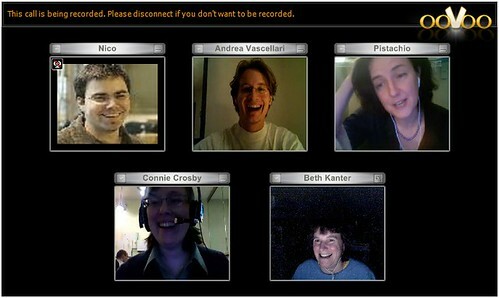 I remember in 2006 - Nancy's wonderful session on the 7 Online Compentencies (I didn't attend). 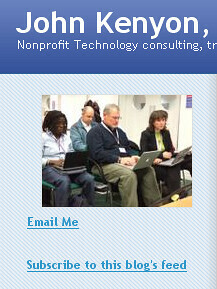 Alan recorded it, Nancy put up her slides, and Nick Noakes wove them together. It just happened. This is a great idea of how to document a conference and perhaps encourage remote participation. Next week, I'm participating in a session at LASA in the UK via My Oovoo or skype. Maybe we can create something like this? What do you think Laura? Several months ago my colleague Mary Joyce (who I met at the Global Voices Summit in London in 2005) and who is now at the Berkman Center pinged me and asked if I knew any digital activists in Southeast Asia. I joined the various Burma Facebook groups early on because my colleagues in Cambodia were involved from the beginning and documented some of the activism taking place across various social media sites, including Facebook. I helped her track down the people behind the Support the monks Campaign and Facebook Burma Group, an unofficial representative in the UK named Imran Jamal, Burma Global Action Network. She was looking for presenters for a conference and she just pointed me over to Ethan Zuckerman's insightful analysis of Facebook activism. Ethan's notes points to the long-term benefits (and challenges) of converting some of the people involved into long term supporters. The people who got involved weren’t dedicated activists, for the most part. They were bored students, clicking on their friend’s links, possibly being drawn in by some of the striking images of monks marching in the streets. The hope is that some percentage of the people involved with these groups could turn into long-term advocates, but Jamal characterizes many of the users as “serial activists”, moving from Darfur to Burma to whatever cause is next. I also think some of the problems with the interaction and feature design of Facebook Groups also makes it challenging to help these activists climb the ladder of engagement. (I've written about this here) It also makes me curious about the concept of "serial activists" and whether this is a by-product of rapid attention shifting. There were clear upsides to the Burma Fcebook group. At the very least, it worked as an intermediary between the different Burma activist groups, some of which don’t communicate well with one another, and many of which are poor at communicating with the wider world. But there were a lot of downsides as well. The organizers found themselves characterized as spammers by the Facebook operators because they were sending too many messages a day. Jamal wonders whether Facebook is simply a glorified petition. “It’s very easy for peopl to join, but there’s no guarantee they come back, and it’s not neccesarily the tool for building an activist base.” One of the major things the BGAN group tried to do is move dedicated users to their website, in the hopes they would get more engaged with the effort, and that communication could be organized outside the Facebook structure. Is Facebook interaction design a one-night stand, with no flirting? 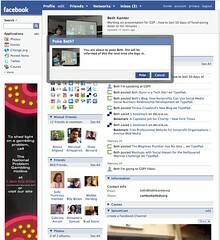 How do Facebook applications incorporate the ladder of engagement? Steve MacLaughlin and Claudia from Convio were kind enough to each send me a review copy of this new book on fundraising and social networks called People To People Fundraising. That let's me keep one for my bookshelf and give away the second copy. So, here's how this book giveaway is going to work. Since I have the copy in my hand, I'm willing to pack it in my suitcase and take it to the NTC in New Orleans next month and hand it to you. So, what do you need to do to win a free copy of this book? Just leave a comment with you best advice for person-to-person fundraising strategies. Of course, I haven't much time to sit down and read the book from cover to cover and there is a lot in there for larger organizations plotting integrated strategies and some good case studies. There's a good chapter by Steven R. MacLaughlin on the changing nature of community. I also read the chapter by Katya Andresen and Bill Strathmann from Network for Good about People-to-People Fundraising. You can read a 2-page summary here. 5. Cultivate your growing circle. Okay, so drop your best advice in the comments about person-to-person fundraising. If you want me to hand you the book, you'll have to be at the NTC in New Orleans. The winner will be announced before I board on the plane for New Orleans. I read the book on the plane and write a review later.